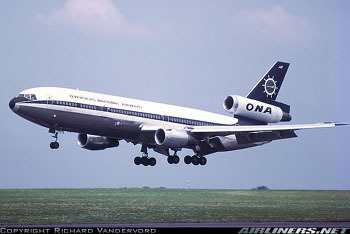 At approximately 1310 Eastern Standard Time on November 12, 1975, Overseas National Airways (ONA) Flight 032, a McDonnell Douglas Model DC-10-30 airplane, crashed while attempting to take off from John F. Kennedy (JFK) International Airport, New York. During takeoff roll on runway 13R, the airplane struck a flock of sea gulls, causing the crew to perform a rejected takeoff. The number 3 engine and several tires and wheels disintegrated, and the landing gear collapsed. A resulting fuel leak led to an extensive ground fire which destroyed the airplane. Of the 128 passengers and 11 crewmembers on board, two people were seriously injured and 30 were slightly injured.